The Cashmere Stitch is a luxuriously-textured filling stitch that is also often used in needlepoint to create elegant backgrounds. Worked diagonally in rows that run from top to bottom, the basic variation of this stitch flows smoothly down the canvas with a "short-long-long-short" stitching rhythm. Since the stitch itself has a rich texture, it is suitable for all kinds of needlepoint thread varieties. 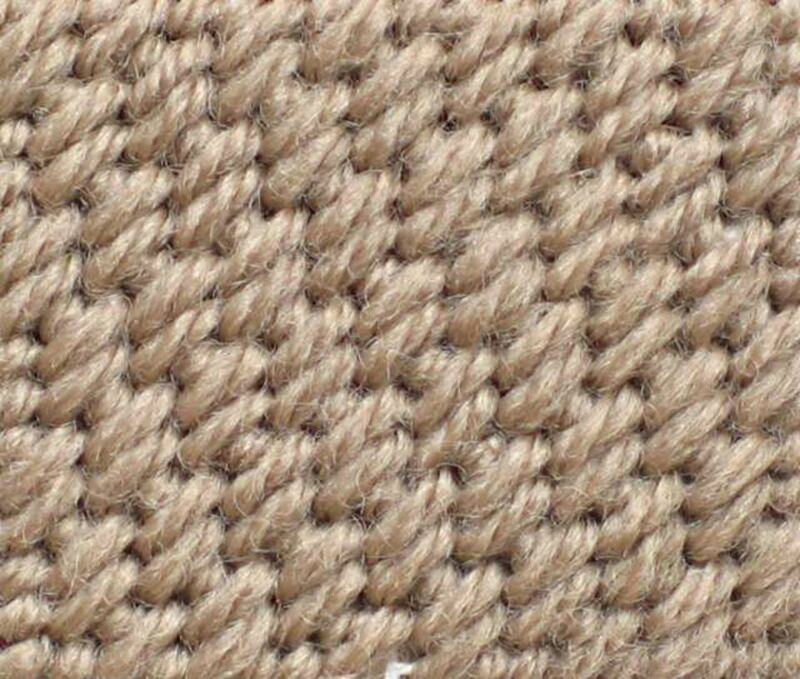 However, the smoother the thread finish, the more delicate and soft the Cashmere Stitch will look and feel. To see how the Cashmere Stitch looks when worked in a needlepoint project with a large background area, the Love Memory Thread Postcard is a great example. No matter the variation, all Cashmere stitches are formed the same way with diagonal stitches of one short stitch, two long stitches followed by another short stitch to complete the shape. Use these easy instructions to work the basic variation of the Cashmere Stitch. The Basic Cashmere Stitch always starts at the top left of the canvas area and works in diagonal rows to the bottom right of the area. Using the above stitch diagram as a guide, follow these steps to learn how to make the Basic Cashmere Stitch. Bring the needle up through the canvas near the top left corner of the area you are going to fill at position (1). Cross over one canvas thread at position (2) and go back down into the canvas, as if making a half-cross tent stitch. Come up in one hole lower at position (3) and cross over two intersections at position (4) and down into the canvas. Repeat for positions (5) and (6), and then make one short stitch at positions (7) and (8) to form an oblong block. Bring the needle up through the canvas one hole below the previous stitch at position (9), and repeat to form an oblong (positions 9 to 14). Continue stitching diagonally at positions (15) to (20) etc. Work the above steps in diagonal rows up and down the canvas, either by turning the canvas around and starting again at the top, or if you are comfortable, working on either side of the row you have just completed going up or down to make each new row. If you are comfortable working the Mosaic Stitch; then the Straight Cashmere Stitch will be quite easy to learn. It is a boxy filling stitch that is worked similar to its basic counterpart, only in vertical blocks. The Straight Cashmere Stitch makes a very strong impression on a needlepoint design. Its strong texture will change the overall appearance of a needlepoint project; so if you are planning to use it for a background, experiment first to make sure it will not overshadow the central design motifs. Check out these easy instructions and detailed stitch diagram to learn how to work perfect rows of Straight Cashmere Stitches. When worked properly, the Straight Cashmere Stitch forms a thick tight backing that will require more thread than the basic technique. To guarantee excellent coverage on the back as well as the front of the canvas, use the above stitch diagram while following these three quick steps. Bring the needle up through the canvas area at position (1) and across one canvas mesh intersection to go down into the canvas at position (2). Work the next two stitches across two intersections of canvas at positions (3) to (4) and (5) to (6). The final stitch in the sequence is worked over one intersection at positions (7) to (8), completing one vertical block. Continue across the row making as many complete vertical blocks as possible to fill the design area. Work the rows in alternating directions - left to right and then right to left until the design area has been filled entirely with complete vertical blocks. Go back and place compensating stitches. Some of these stitches may end up looking like Mosaic and basic tent stitches as you fill in tiny spaces.